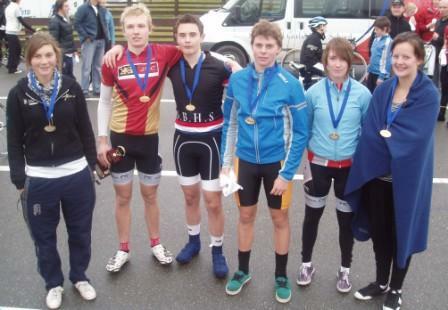 James Hargest High School successfully defended its title at the Southland/Otago Secondary School Road Cycling Championships at Teretonga on Sunday. Having earlier this year taken out the overall Secondary School Track Championship there can be little doubt of its standing as the south’s premier cycling school. Held in overcast and chilly conditions, James Hargest finished the day with 22 points, claiming its seventh consecutive School Title, holding off Dunstan High School (17) with Southland Boys High School finishing third on 14 points. The day featured an Individual Time Trial and Road Race in three Age Group categories for both boys and girls and finished with a Team’s Time Trial. Dunstan High School’s Tom Vessey completed the day’s most dominant performance, blowing away the field in the Under 17 Boys Road Race to finish ahead of chasing pack by over a minute. 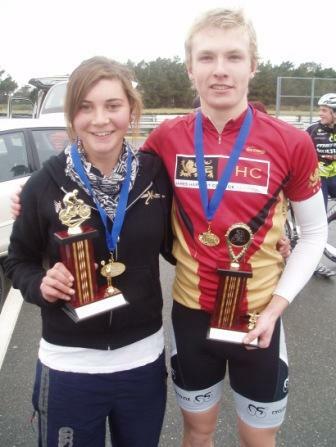 Schoolmate Sophie Williamson ensured a happy bus trip home to Central Otago for the Dunstan team, completing the double by winning the Time Trial by a solitary second and the Road Race in a sprint finish. Southland Boys High’s Michael Culling again turned in an eye-catching display, covering the 8 kilometre time trial course more than a minute faster than his nearest rival and then backed up to comfortably win the Road Race. For results from the Team's Time Trial click here.